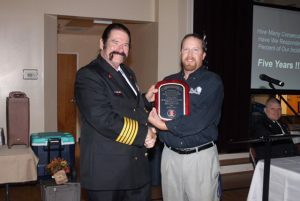 Virginia Office of EMS representative Doug Layton presents the 100 Percent Response Award to Little Fork Volunteer Fire & Rescue Chief Doug Monaco during its 2017 awards banquet. Thanks to the Culpeper Star Exponent for their excellent coverage of our 2017 Awards banquet. This article is excerpted from the October 23, 2017 edition of the Culpeper Star Exponent newspaper. Click Here for the complete story. Little Fork Volunteer Fire & Rescue Company of Rixeyville was recently recognized – for the fifth straight year – for responding to 100 percent of emergency calls made. Doug Laughton with the Virginia Office of Emergency Medical Services acknowledged the stellar record at the company’s 23rd annual awards banquet held at Jeffersonton Baptist Church. More than120 members, guests and special guests attended the Oct. 14 banquet at which Chief Doug Monaco reported that the company ran 227 fire calls and 399 EMS calls July 1, 2016 to June 30, 2017. His report noted that 61 volunteer members serve the Northern Culpeper area comprised of 65 square miles – approximately 5,000 homes and businesses. Little Fork VFRC responded to incidents with property values totaling $3.097 million with their actions saving $2.275 million worth. The company also saved local property owners more than $2.1 million in additional insurance premiums.